The Birthday Fairy, in her benevolence, bestowed several beautiful books on my baby for her birthday. 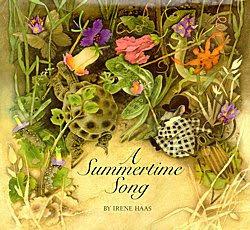 None of these were more magical or more full of whimsical summer revelry than A Summertime Song by Irene Haas. Little Lucy receives an invitation to a garden party from a messenger frog who hops through her window. The evening that follows is filled with magic party hats activated by moonlight, French-speaking mice, a taxi-driving baby bird and a mysterious owl who wears a top hat. Irene Haas' lyrical story is accompanied by her elaborate and fanciful illustrations. They are so captivating. We love to take our time reading this book, scanning each picture for new details we've missed previously. It's no wonder the Birthday fairy left this book, wrapped in fairy paper, on the little one's nightstand. We'll have to write her a thank you note.